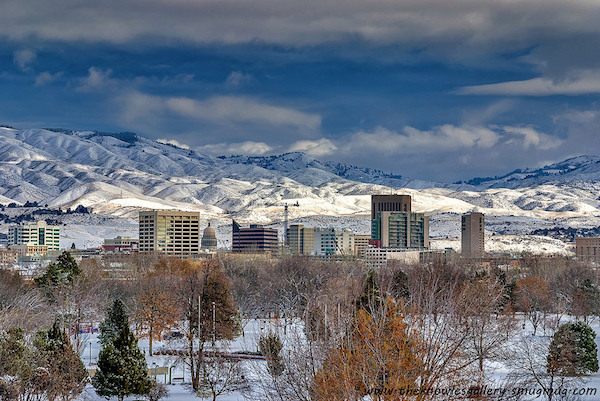 Capital and largest city in Idaho, Boise is a recreational mecca. 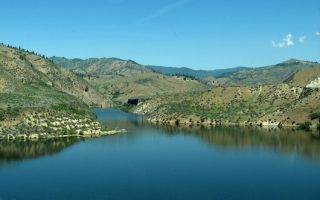 The setting is beautiful, with a river running through the city and the foothills of the Rockies to the immediate north of downtown. Running in Boise is a treat. 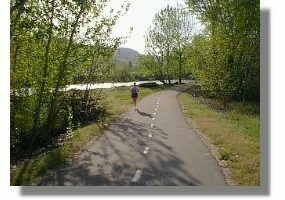 A 25-mile greenbelt showcases the river, while an extensive network of trails criss-cross the foothills, which rise above the Capitol. 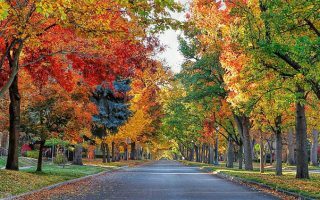 There’s also lovely neighborhood running in downtown’s East End and North End, with a loop around the Capitol, When you’re done running, enjoy Boise’s fun dining and indie music scene! I-84 is the major interstate serving Boise, with I-184 connecting I-84 with downtown. There is a bus system operated by ValleyRide, but public transport is not extensive. To get to the trail running north of downtown, a car is required. Wonderful greenbelt with more than 25 miles of trails, mainly paved, on either side of the river. Good spur trails. Nice river views in sections, several parks. Our route starts centrally at Capitol Blvd., going east and west for 4-5 miles. Only minutes from downtown, a 190-mile series of interconnected roads and trails offers a unique running experience. Mainly open with great views and incredible variety. 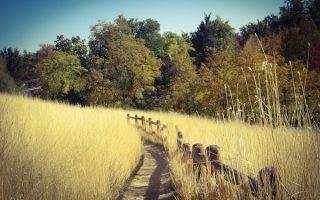 Website with great interactive trail map. A complement to our Foothills Overview. Here, we offer a few specific route reccomendations among the 190 miles of interconnected roads. Camel's Back, Military Reserve, Harrison Hollow. Something for everyone! 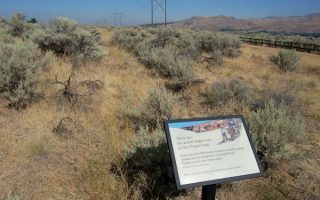 A wonderful 5.5 mile tour of Boise highlights. 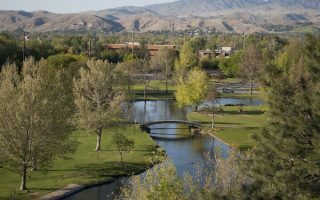 Campus of Boise State, several parks along the greenbelt, numerous museums and important Boise sites near downtown. Can add a jaunt to Capitol (1 mile RT). 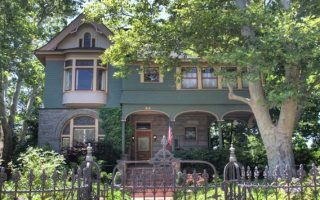 The East End, bound by Warm Springs Ave., is a Historic District and very pleasant for running, with tree-lined streets and gracious Victorian homes. DIY route, or our 5.3 mile run incorporates the best area streets and a jaunt around the Capitol. Very pleasant neighborhood for running, with tree-lined streets and lovely homes. It's ~1 mile north-south and east-west. Harrison Ave., Hyde Park, Capitol are highlights. Can combine w/East End/Warm Springs area, trails to north. One of the longer, flat runs in Boise, with good water and mountain views. The Greenbelt in the southern area runs between Barber Park and Luck Peak State Park, paralleling Eckert Rd. & Warm Sprints Ave., to the Discovery Picnic Area. Southeast of downtown. 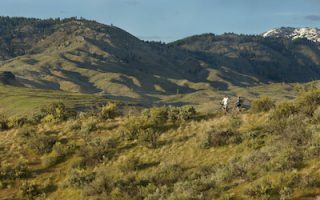 Offers a more desert-like running experience, with great views of the basalt cliffs and the Boise Front. Several loops within the park, up to 3 miles. Or, the hilly and challenging Oregon Trail, 8 miles out and back. ees, so bring a layer! In winter, days average just above freezing, while nights typically dip into the 20s. 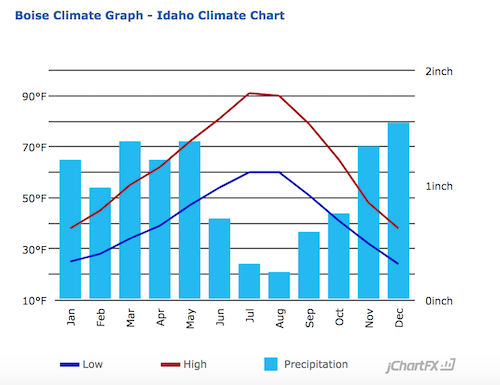 It is a dry climate, averaging only 11 inches of rain annually–most of it in winter. Significant snowfall is rare. Shu’s/Idaho Running Company. Marketplace Mall, North End. Group Runs Thursdays 5:30. Bandanna Running and Walking. In business for 20+ years! Downtown at 5th & Main. Group Runs: Events Calendar. Idaho Great Potato. May. This event offers a distance for everyone: the marathon, half-marathon, 10K, and the 5K. City of Trees Marathon November. Flat, fast and beautiful.